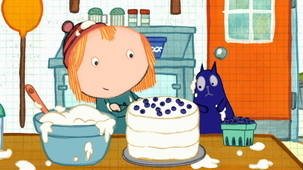 Peg + Cat is also available on Mini TFO A section just for the kids, without ads! Click to explore! 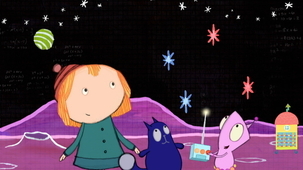 When it comes to solving problems, Peg takes a very "left brain" approach. She's always organizing. Ordering things. Writing equations on the graph paper with her twig, as she fearlessly leads the quest to solve the problem. Peg plays the ukulele, which she can pull out anywhere and everywhere. 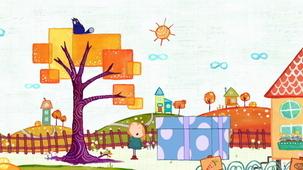 Peg and Cat climb the magic beanstalk to visit the giant family and babysit their new giant baby. But first, they have to learn the combination to the wardrobe, which contains the ever-important emergency numbers. 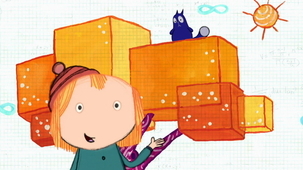 Peg and Cat make a see-saw, but it only works if they have the same weight on both ends. But when it´s the big dog´s turn to play, his weight causes quite the conundrum! Peg and Chat have got to catch this pig. They decide to build a giant pig catcher! They need a pyramid for the base, four cylinders for added support... but where can they find some giant pillars? And will they find them in time? 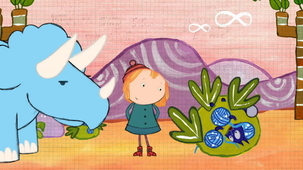 When Peg and Cat get lost riding dinosaurs through a prehistoric forest, they must use a diagram to find their way to safety before the Baby T-Rex catches up to them. When Cat is stuck in a tree again Peg needs to find a different way to get him down. Peg's Neighborhood. When Cat is stuck in a tree, Peg must figure out how to get him down using three giant gifts.